This is the public profile of Arc Studio Architecture + Urbanism Pte Ltd, Additional information and high-resolution images are available for accredited press members, to access additional information about Arc Studio Architecture + Urbanism Pte Ltd please login as a press member. About Arc Studio Architecture + Urbanism Pte Ltd : ARC studio is founded by the husband and wife team of Khoo Peng Beng and Belinda Huang in 1998. ARC Studio is a creative place that embraces diversity, collaboration, open-minded communication and the greatest challenge of all, change. Nature is ARC Studio’s tool, big and small, finite and infinite. Their fuel is anything that stimulates the imagination. Most of all ARC Studio is inspired by the interaction with their Clients, their collaborators and the people who will eventually use their designs. ARC Studio’s exciting portfolio ranges in scale from self-sufficient eco-townships incorporating permaculture in the highlands of Malaysia to super high rise high density housing projects in congested urban centres to highly customized homes and work environments. 1993, Architecture, Bachelor of Architecture (Honours), National University of Singapore, Singapore. 1990, Architecture, Bachelor of Architectural Studies, National University of Singapore, Singapore. 1990-1991, Assistant Architect at SAA Partnership, Singapore. 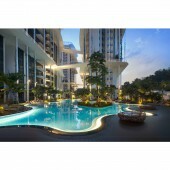 1993-1999, Architect at RSP Architects Planners & Engineers Pte Ltd, Singapore. 1999-present, Co-founder and partner of Arc Studio Architecture + Urbanism Pte Ltd, Singapore. with Belinda Huang, Erik G. L’Heureux and Florian Schaetz, Singapore. 2015, "1000 Singapore: 8 Points of the Compact City", Cité de ľArchitecture et du Patrimoine, with Erik G. L’Heureux and Florian Schaetz, Singapore. Press Members: Request an exclusive interview with Arc Studio Architecture + Urbanism Pte Ltd.